LG Chem will build EDC manufacturing plant with capacity of 300,000 MT in Gladstone, Australia by 2005 through cooperation with Cheetham Salt Ltd. of Australia and others. We chose Australia since it has easy access to low-cost electricity and salts, and a large market for caustic soda, its byproducts. Based on the company strategy to focus on selective core business areas, and the company’s restructuring efforts, the epoxy business was decided to be sold to Bakelite, a German company. Epoxy business is recognized as a non-core business for the long-term business strategy, with limitations in gaining competitive edge due to increased competition and excess supply. Bakelite is the world’s first developer of Phenol, specializing in thermo setting resin. Recently, Bakelite is making aggressive entry into the Asian region in areas such as EP compound and Epoxy resin. NanoH2O Inc., a manufacturer of reverse-osmosis membranes 逆浸透（RO）膜 that purify seawater to drinking quality while lowering the cost of desalination, is being purchased by Seoul-based LG Chem Ltd. for $200 million. The Southern California startup, established in 2005 from research that stemmed from the University of California at Los Angeles, makes water potable from fresh, brackish and saltwater sources. The acquisition is expected to close next month, LG Chem said in a filing to the Korea Exchange on March 14. The purchase takes place amid record drought from California to southeast Asia and rising water-scarcity issues. NanoH2O, whose nanocomposite and polymer technologies improve energy-efficiency and power costs in water production, has been backed by investors including Khosla Ventures, Oak Investment Partners, BASF Venture Capital GmbH, Total Energy Ventures International and the China-focused fund Keytone Ventures. NanoH2O agreed in 2013 to build a plant on the Yangtze River delta at Liyang, China, that’s due to be completed later this year. With the second-largest economy, China is one of the biggest desalination markets in the world. LG Chem’s board of directors approved buying NanoH2O to boost its water-treatment filter business, according to the March 14 statement. The Korea Economic Daily and Yonhap News Agency earlier reported the deal. NanoH2O Inc., manufacturer of the most efficient and cost-effective reverse osmosis (RO) membranes for seawater desalination, today announced plans to build a manufacturing facility in Liyang 栗陽, China, a city in the Yangtze River Delta 250 kilometers west of Shanghai. The 10,000 square meter facility will be the company’s second fully integrated manufacturing plant, following the first located in Los Angeles, California. The China facility comes at a total investment of $45 million and is expected to be operational by the end of 2014. NanoH2O, Inc., manufacturer of the most efficient and cost effective reverse osmosis (RO) membranes for seawater desalination, has been selected for two large projects in the Kingdom of Saudi Arabia. The first project, awarded by Al Fatah Water and Power International, is for phase II of the Jubail desalination plant in which QuantumFlux membranes will produce 13,000 cubic meters of water per day. The second project, a desalination plant to be designed by AES Arabia at the King Abdullah University of Science and Technology (“KAUST”) Research Park, will produce 15,000 cubic meters of water per day. Both installations are scheduled for 2014. Renault S.A., the world's largest manufacturer of electric vehicles (EV), said Wednesday that it has signed an agreement with LG Chem to jointly develop high density batteries that will power its next-generation zero emission cars. The French automaker, which controls Renault-Nissan Alliance and South Korea's Renault Samsung Motors Co., said the agreement lays the foundation for its next-generation EVs to be powered by lithium ion batteries made by LG Chem, already an established leader in the vehicle power storage sector. The batteries will give cars longer endurance and reduce range concerns that have restricted growth of the global EV market. Renault currently markets the Twizy, Zoe, Fluence Z.E. and Kangoo Van Z.E. electric cars. Counting Nissan's Leaf, the world's fourth-largest automotive alliance had sold 100,000 EV as of July 2013. In South Korea, Renault Samsung sells the SM3 Z.E. that is based on the Fluence. Thierry Bollore, the carmaker's chief competitive officer who signed the agreement for Renault in Seoul, outlined the company's commitment to making battery packs that can power zero emission cars. The executive confirmed the company's desire to contribute to the growth of South Korea's car industry through Renault Samsung. LG Chem said the latest tie-up with Renault will speed up demand for EVs and make them more commonplace. Renault, the world's top producer of electric vehicles (EVs), has agreed with Korea's LG Chem to use LG-developed batteries for its next-generation EVs, LG Chem said Wednesday. "LG Chem will jointly collaborate with Renault Group for the development of next-generation rechargeable batteries to be used in Renault's new and premium EVs, which will be coming out a few years later," said LG Chem spokesman C.S. Song. Song said that Renault's upcoming EVs will adopt LG-patented high-density and energy-efficient lithium-ion batteries. The spokesman declined to unveil additional details such as the guaranteed battery volume LG promised to the French car manufacturer. Under the agreement, Renault technicians will be coming to LG's battery-manufacturing factory in the local provincial city of Ochang, south of Seoul. "Two or three more years will be needed to report visible results," the official said. LG Chem President Kwon Young-soo said the agreement will help the firm stay ahead of its rivals in the heated race for EV batteries. Kwon said LG Chem will further strengthen its strategic business partnership with Renault. Renault is one of the most-trusted of LG Chem's battery partners. While Renault has a battery-making division — AESC, a joint venture between Nissan and NEC — the French automaker has been consistent in using LG-developed batteries over the last few years. LG Chem has been supplying its batteries to Renault's three EV models — Twizy, Zoe and SM3 Z.E. South China, which houses a significant share of China’s plastic manufacturing, has never had local ABS production, until now. CNOOC & LG Chem Petrochemicals Co. Ltd., a 50/50 joint venture between China’s state-owned CNOOC and Seoul-based LG Chem, has commenced production on its 150,000-ton phase one project in the spring of 2014, the company told Plastics News. The company is “actively preparing for” the second phase, which has been approved by the provincial government and double the plant’s capacity to 300,000 tons upon completion. The plant is located in the Daya Bay Petrochemical Industrial District in Huizhou, Guangdong province, neighboring CSPS (a JV between CNOOC and Shell) and the Huizhou Refinery and Ethylene project. It conveniently sources feedstock “across the wall” from its neighbors, the company said in a statement. Given the oversaturation of China’s standard ABS market, this plant is focused on specialty grades and high-end standard grades, serving processors in South and East China. The company said it is supplying materials to appliances giants as well as makers of consumer products and toys. The total investment of the plant comes to 2.5 billion yuan ($400.8 million). The project was initiated in 2008, when the two companies signed a framework agreement. South Korean chemicals and battery maker LG Chem on Monday said it plans to acquire pharmaceutical affiliate LG Life Sciences for about 1.1 trillion won ($989.56 million) to make its bio business a new growth engine. LG Life Sciences investors will receive about 0.26 of a common share in LG Chem for each share they own and about 0.25 of a preferred share in LG Chem, the two companies said in a regulatory filing. LG Chem said it would complete a merger by Jan. 1. In January, LG Chem agreed to buy seeds, pesticides and fertilisers maker Dongbu Farm Hannong for 515.2 billion won. The company said it would achieve a sales of 5 trillion won from its bio business by 2025. "LG Group seems to be seeking next-generation growth engines through the merger," said an analyst. LG Life Sciences was spun off from LG Chem in 2002 but failed to make a major breakthrough in the country's pharmaceutical industry — its sales amounted to 450.5 billion won last year, less than half of market leader Hanmi Pharmaceutical's 1.32 trillion won. In August 2002, LG Life Sciences was upgraded from a business division to a full-fledged LG affiliate in order to grow as a life sciences specialist and maximize shareholder value. LG Life Sciences began research in genetic engineering in 1981 and has invested steadily in the life sciences ever since. This effort has already resulted in world-class technology and product capabilities. The company has focused R&D resources and know-how on three areas-pharmaceuticals, animal health and specialty chemicals. LG Life Sciences has developed and commercialized an array of pharmaceuticals over the years. These include interferon in 1989 (Intermax-gamma) and 1992 (Intermax-alpha), hepatitis B vaccine in 1992 (EUVAX B™), human growth hormone in 1993 (EUTROPIN™), degenerative arthritis treatment in 2005 (HYRUAN Plus™), rhFSH (recombinant human follicle stimulating hormone) in 2006 (Follitrope™), and SR-hGH (Sustained Release-human Growth Hormone) in 2007 (Declage™). A company milestone was reached in 2003, when its next-generation quinolone antibiotic (FACTIVE®) was approved by the FDA in the United States. LG Life Sciences has succeeded in animal health products including the 1994 commercialization of recombinant bovine somatotropin (BST, product name BOOSTIN®). The product, which is used to increase milk production in lactating dairy cows, has achieved the top share in numerous national markets. In 2006, LG Life Sciences has also launched a bovine mastitis vaccine (MastaVac) that reduces the number of somatic cells, relieving clinical symptoms in a cow that has been infected with mastitis. As for specialty chemicals, LG Life Sciences completed in-house development of Korea's first new herbicide (PYANCOR®) for rice in 1997 and fungicide (GUARDIAN®) for use in horticulture in 1999. A new herbicide (FLUXO®) for both pre- and post-emergence rice was completed in 2004. LG Chem will invest a total of 300 billion won ($278.6 million) to expand its petrochemical facilities in Yeosu, South Jeolla Province, the company said Tuesday. With the investment, the company plans to increase the annual production capacities of crude acrylic acid and super absorbent polymer by 180,000 tons and 100,000 tons, respectively. When the expansion is completed by 2019, the chemical giant’s production capacity of CAA will increase to 700,000 tonnes/year and SAP to 500,000 tonnes/year. LG Chem expects its annual sales to grow by US$280 million, it said in a statement. LG Chem’s fourth super absorbent polymer (SAP) plant in the Yonseong district of the Yeosu National Industrial Complex is under construction. If the new plant launches production in September as planned, it will bring the company’s annual SAP production capacity from the current 280,000 tons to 360,000 tons. “SAP requires an advanced technology, so it has emerged as a strategic material to make a difference between our company and Chinese competitors,” said Song Hee-yoon, head of LG Chem chemical products plant. He went on to say that LG Chem sees its production capacity surge five-fold in seven years after the company entereed the SAP business in 2008. SAP is a polymer material that can absorb pure water up to several hundred times its own weight. Despite the sagging chemical industry, LG Chem plans to expand investments into new materials for new growth engines. In a recent meeting with reporters, LG Chem Vice Chairman Park Jin-soo unveiled a blueprint to create inorganic materials, innovative batteries and future materials that have not yet hit the global market, with the goal of raising revenues in those segments to 1 trillion won by 2020. To this end, he said LG Chem plans to expand R&D outlays from 600 billion won this year to 900 billion won by 2018, and raise the number of researchers from 3,100 to 4,100. Research manpower specializing in future materials will work at LG Chem’s research center in Gwacheon, Gyeonggi-do, which is scheduled to open soon, and LG Science Park LG Group plans to construct in the Magok District in Seoul will be utilized to research new materials. Vice Chairman Park said LG Chem, which started out with nothing at the Yeosu plant 40 years ago, has now evolved into a business with an 1,800-fold production increase, and the Yeosu plant will create a new chapter in LG Chem’s history. He said LG Chem will continue to invest into the materials sector until people recall LG Chem is No. 1 when it comes to materials that make human lives richer. 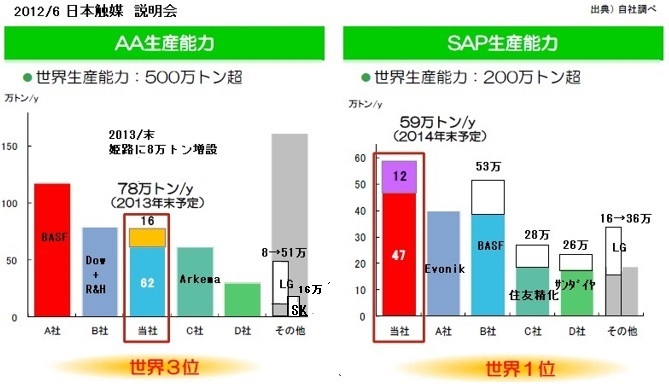 LG Chem aim to raise sales in the overall materials field, including basic material segments such as Sap and engineering plastic, information electronics like OLED lightings and energy storage systems to 12 trillion won by 2018. The company targets at 2 trillion won in sales in 2015, a two-fold increase form 2014. LG Chem Petrochemical business unit has eight domestic and 26 overseas plants, including a plant in Gimcheon and a newly established Yeosu SAP plant. The new 36KT SAP plant in Yeosu will help strengthen SAP business as LG Chem’s core and strategic businesses. Moreover, with continuous investment in SAP business further expansion is scheduled each year. The vertically integrated facility guarantees highly sustainable source of supply for customers. Second, through state-of-art R&D and high quality products, the company will continue to develop. Finally, with a customer-oriented mindset, LG Chem says it will support customers’ needs and value creation by solution partner project. By taking control of raw materials from naphtha and SAP, LG Chem is one of the few chemical companies in the world that is truly and vertically an integrated SAP supplier. From GS Caltex, naphtha is delivered to LG Chem’s NCC plant where 1,130KT propylene produces as the raw material. Then, this propylene is delivered to the Acrylic Acid (AA) plant, which produces 193KT of Acrylic Acid. And finally, at the Gimcheon and Yeo-su plant, AA is transformed into SAP with an annual capacity of 108KT to 72KT in Kimcheon 36KT here in Yeo-su. Caustic Soda is also vertically integrated from upstream to SAP plants with the capacity of 225KT. LG Chem guarantees its customers a stable supply of SAP to a perfect vertical integration. South Korea’s LG Chem Ltd said on Wednesday it had agreed to build two joint ventures with China’s Zhejiang Huayou Cobalt 浙江華友鈷業股份有限公司 to lock in supplies of cobalt for lithium-ion batteries. The plan comes as South Korean companies step up efforts to secure battery metals including cobalt to meet rising demand for electric vehicles. Huayou Cobalt confirmed the arrangements. Under the deal, LG Chem said it would raise a total of 239.4 billion won ($224.8 million) by 2020 to set up precursor and cathode joint ventures in China. The joint ventures are expected to start producing 40,000 tonnes a year of precursors and cathodes from 2020, the South Korean battery maker said in the statement. LG Chem said it plans to use precursor and cathode materials produced from the joint ventures for its battery plants in China and Poland.